I'm very excited for the start of Daylight Savings time this weekend. Although I hate to lose an hour of sleep, it's definitely worth it to not have to drive home/ walk George in the dark. Even with the coming extension of our daylight hours, the world feels very dark today. My thoughts are constantly on the turmoil in the rest of the world: the earthquake in Japan, the resulting tsunami, and the potential threat to other nations as the wave makes its way toward the West Coast. Looking at the destruction already... it is terrifying. 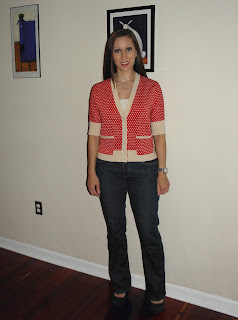 I hate to suddenly start talking about my outfit, but I guess that is the purpose of this blog. Today I decided to dress down, since it's cold out (40 degrees!) and also casual Friday. I'm wearing a Marc by Marc Jacobs cardigan with Rich & Skinny jeans, and my L.A.M.B. Plum Wedges in Navy. You may have seen the Marc by Marc Jacobs Karen Dot Sweater on Jennifer Garner in the movie Valentine's Day, and Rachel (Lea Michele) also wore it in episode of Glee. The sweater is cream and red, with cream polka dots and buttons. It's too cute! I'm also wearing my Rich & Skinny jeans, which I just love. They are so comfortable.